Save Time on System Design Easy hardware configuration process, plus effortless communications setup–COM tasks reduced to simple configuration. Excellent User Experience UniApps™: the library of applications that enable you to remotely monitor, debug, and edit data from PC, smartphone, or tablet—from anywhere at any time. Superbly Scalable Expand to meet your application requirements. Slash Costs You benefit from UniLogic Software, Technical Support via phone and email, and access to our Technical forum—absolutely free. Powerful, dual CPUs—that translate into faster scan time, up to 2048 I/Os, and over 2MB of operand memory. High-quality HMI touch panels in different dimensions—together with an easy-to-use HMI editor for elegant screen design. Sophisticated, space-saving I/Os—effortless local and remote I/O installation. 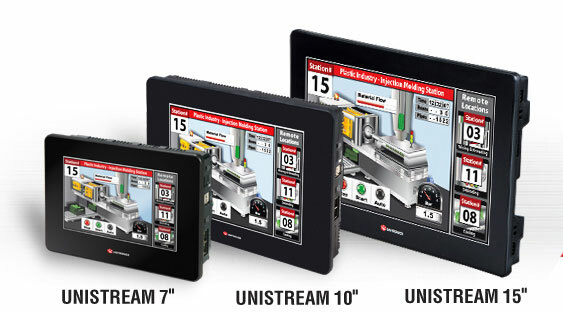 Simple or complex, large scale or small, you can tailor UniStream™ to suit your precise application requirements: select your preferred HMI panel, snap a CPU onto its back, and then snap on I/Os to create a compact all-in-one controller. Each controller can support up to 2,048 I/Os.